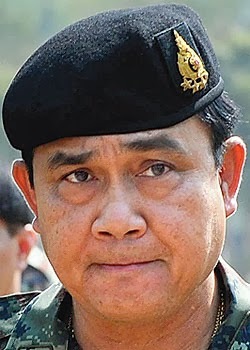 The Royal Thai Army on Sunday condemned an anti-coup activist and supporter of former prime minister Thaksin Shinawatra after he urged liked-minded people to hold the twin daughters of army chief Prayuth Chan-ocha hostage if the general stages a coup. Mr Sudchai, a former leader of the red-shirt Saturday People Against the Coup group, urged supporters to catch the twins either alive or dead. “Taking them alive as hostages will be very good. But catching them dead is also worth it. Prayuth will know the taste of losing loved ones. Throughout Thaksin Shinawatra's administration he was notorious for intimidating the press, and crushing dissent. According to Amnesty International, 18 human rights defenders were either assassinated or disappeared during his first term in office. Among them was human rights activist and lawyer Somchai Neelapaijit. He was last seen in 2004 being arrested by police and never seen again. Also in 2004, Thaksin Shinawatra oversaw the killing of 85 protesters in a single day during his mishandled, heavy-handed policy in the country's troubled deep south. The atrocity is now referred to as the "Tak Bai incident." Considering this disturbing history of assassinations both attempted and successful, of Thaksin Shinawatra's long list of enemies, threats made by him, his associated, or his supporters are not "isolated," but a continuation of wanton brutality indicative of dangerous and intolerable despotism. With every move, the current regime both vindicates and justifies continued protests in the streets and in the wake of these most recent and abhorrent threats - threats which have so far gone uncondemned by the regime itself, Thais who have so far decided to remain silent, should consider if the nation's future can afford to continue tolerating Thaksin Shinawatra's political machine and the malicious, dangerous people it creates.